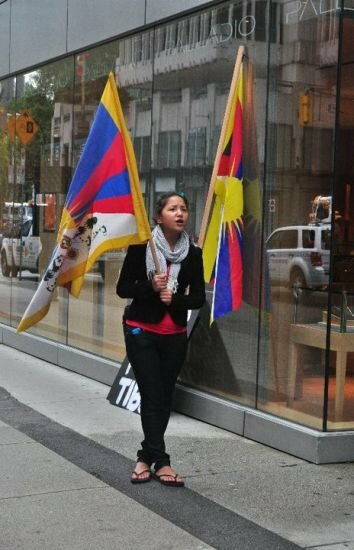 A demonstration took place in Vancouver against the Canadian Chinese-controlled company CGG for its acquisition of a mine in Tibet, which will further aggravate human rights violations and environmental damage caused by mining projects run in the region by Chinese and foreign companies. Local Tibetans and supporters protested the acquisition of the Gyama (Ch. Jiama) mine by the Vancouver company China Gold International Resources (CGG). The protest occurred in front of the Terminal City Club at which a CGG shareholders meeting was taking place where the company was seeking (and received) “approval from its disinterested shareholders for the acquisition of Skyland Mining, the owner of the Jiama Project” (CGG news release, Oct. 14, 2010). The Gyama mine is in Meldro Gunkar County, about 70 km. northeast of Lhasa, Tibet. It is the result of consolidating several smaller operations by China Nation Gold Group, a Chinese state owned company, in partnership with the previous operators. Protests against mining in Meldro Gunkar started in the early 1990‘s soon after the miners moved in to exploit the ore deposits. Farm and grazing land was confiscated, and animals died because of toxic materials released in drinking water. Several Tibetans were tortured and given lengthy prison terms for non-violent protests against the activities of the miners. Protests have continued up until the present, the last internationally reported protest being in August 2009. The Canadian protests were in support of the residents of Meldro Gunkar. Across Tibet, there has been an increase in the number of protests regarding mining projects over the last decade. China began a program to exploit Tibet’s resources in 1990‘s. Until then the exploitation had been limited due to the difficulty of accessing deposits. With better roads and now a train, Chinese and foreign companies have been aggressively exploring and developing mineral properties. A concurrent program of hydropower development is intended to power the mineral processing plants and residences of Chinese migrant workers. Canadian companies, like Continental Minerals and Inter-Citic, have collaborated with state agencies in this mine development. CGG is a unique case as it is controlled by the state owned China National Gold Group, which was also the major shareholder in the Gyama mine. Protestors have a long list of concerns including Human Rights abuses, environmental degradation and pollution, confiscation of property, forced resettlement, imprisonment, torture and death of those that protest against development, destruction of holy and historical sites, corruption of officials, uncontrolled immigration of large numbers of Chinese workers, as well as the fundamental issue that Tibet’s resources should be controlled by a government that represents Tibetans, not the Chinese Communist Party.